Love him or hate him, Glenn Beck is a media phenomenon. This is why this former Fox News commentator has been able to strike out on his own—and make money doing it. One of Beck’s successes is his creation of the TheBlaze.com subscription Internet TV channel, which has also secured carriage on DISH Network and many regional cable TV systems. TheBlaze is a 24/7 news/talk operation. It produces and carries Glenn Beck’s TV and radio shows, and a range of other original radio/TV programs. It was originally branded as GBTV (Glenn Beck TV). Headquartered in New York City with an office in Washington, DC, TheBlaze’s main production facilities are located in Irving, Texas. They are located in the historic 72,000-square-foot Studios at Las Colinas, where the movies Robocop, JFK, Silkwood, and the TV series Prison Break were filmed. Beck originally leased a portion of the studio, and then purchased the entire complex. The space is now used for TheBlaze’s ‘Mercury Studios’— named in honor of Orson Welles’ Mercury Theatre on the Air—and Beck’s “American Dream Labs” movie development unit. On the main production set of TheBlaze. As the home to Glenn Beck’s TV show and video simulcast radio show, a number of other TV shows, and 24/7 news room, TheBlaze needs to keep a close eye on the world media. This is why TheBlaze’s technical department provides a menu of TV channels to HDTVs throughout the complex. TheBlaze’s internal channel lineup includes dedicated and network TV news channels sourced from DISH Network, feeds originating from TheBlaze’s own facilities, and live Skype feeds for on-air interviews. The lineup also includes audience data from ChartBeat.com. It is the Web analytics provider that tracks how many people are reading articles on TheBlaze.com at any given time, in real-time. There are a number of ways that an internal TV system can be served with a custom mix of external and internal video feeds; including porting them over IPTV. 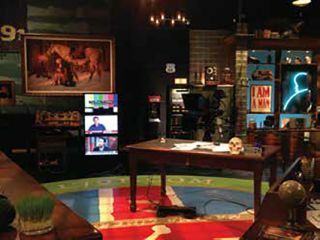 Building upon an approach used in its New York City facilities, TheBlaze opted to install a cable TV RF-based distribution system. This is a simple yet robust approach that gets everyone what they need, while keeping equipment and operational costs low. The internal TV signal package at Mercury Studios is made up of commercial TV signals accessed through a series of conventional DISH Network receivers and set-top converters, a Contemporary Research tuner, video feeds from the facility’s production facilities, and Skype and other external IP-based feeds that are accessed through CRM Studio’s Utah router. “When TheBlaze started in Texas, there were only about 10 TVs to feed,” Michael Murray noted. “But as the newsroom grew and other programs were added, the demand for in-house TV channels grew, too.” A total of 10 Contemporary Research encoder modulators—eight QMOD-HDs and two QMOD-HDSCs—are used to format the incoming video feeds into individual HD analog channels. “HD analog encoders are less expensive than HD-SDI encoders,” explained Murray. Recently, CRM Studios acquired a QMOD-SDI encoder. It takes the CRM Studios’ control program feed and converts video into an HD digital signal, to increase the system’s carriage capacity. All of the acquired channels are fed into a Contemporary Research QCA9-33 Active Combiner. This creates the cable TV-like menu of channels that is sent through TheBlaze’s inhouse coaxial cable network. The program feed from TheBlaze’s control room is sent through a Blackmagic Design SDI to Analog Open Gear converter card, for one of the QMOD-HD’s. The ChartBeat computer is connected to the QMOD-HDSC. On paper, the architecture of TheBlaze’s internal TV system is pretty simple. However, translating the design into reality has had its challenges. Another issue is the nature of the consumer-grade receivers that provide access to CNN, FOX News, and other outside broadcasters. “These receivers were never designed to run continuously,” said Murray. “The reason: The receivers have a built-in ‘sleep’ function that kicks in if they are left on for extended periods of time; allowing software upgrades to be downloaded during ‘off’ hours.” These upgrades typically happen overnight, requiring the units to be manually restarted in the morning. Since theBlaze runs 24/7, “you can be watching a channel in your office, or it is being shown on camera as background—and suddenly the screen goes blank,” he said. Despite its minor issues, TheBlaze’s internal TV system works extremely well in providing channels to everyone who needs them throughout its Irving, Texas facilities.